April is National Poetry Month! I know what you are thinking—poetry is something assigned to you by a teacher and you kind of understand what the author is saying but maybe not really? Maybe the books you were assigned were a total drag? Fear not friends—I’ve got the scoop on some riveting and fast-paced YA novels written in verse (which is a really fancy way of saying that they’re poetry) that are going to knock your socks off, if you give them a try. And serious bonus points—they are such fast reads! A historical fiction novel in verse detailing the life of Clara Lemlich, from her family roots in Poland, emigration to New York, and her struggle for women's labor rights in the early 20th century. Its quite a riveting look into the cost paid by people like Clara to ensure many protections we enjoy today – from the weekend to safety regulations. Throughout her high school years, as her mother battles cancer, Lupita takes on more responsibility for her house and seven younger siblings while finding refuge in acting and writing poetry. Includes glossary of Spanish terms. In this poetic memoir, Engle—the first Latina woman to receive a Newbery Honor—tells of growing up as a child of two cultures during the Cold War. Her heart was in Cuba, her mother's tropical island country, a place so lush with vibrant life that it seems like a fairy tale kingdom. But most of the time she lived in Los Angeles, lonely in the noisy city and dreaming of the summers when she can take a plane through the enchanted air to her beloved island. When the hostility between Cuba and the United States erupted at the Bay of Pigs Invasion, Engle's worlds collided in the worst way possible. Would she ever get to visit her beautiful island again? Fourteen-year-old twin basketball stars Josh and Jordan wrestle with highs and lows on and off the court as their father ignores his declining health. I know what you are thinking—this book lives in the children’s collection. But trust me, its got all the coming of age, school, and family drama you would expect in a YA novel. 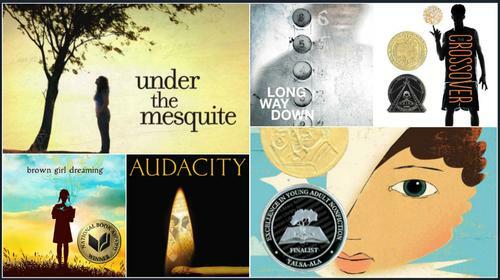 If none of these grab you, there are a ton of others that might, like all the works of Ellen Hopkins—which I assure you would scandalize all of the adults in your life, the multi-award winning Brown Girl Dreaming by Jacqueline Woodson, or really any of the books on this list of YA Novels in Verse! Let me know if you have a favorite in the comments! Check out these riveting and fast-paced YA novels written in verse recommendations (which is a really fancy way of saying that they’re poetry).